For most of us air travelers, America’s north central states are just flyover country. I have flown over the Dakotas more times than I can count. Yet until Sunday I had never set foot in the Dakotas. Perhaps this is because they are so hard to get to. The airlines give the Dakotas short shrift, making flying into these unpopulated states difficult and expensive. So we fly over them instead and mostly what we see out the airplane window seems featureless. Yet, the western side of South Dakota is anything but flat. It is framed by The Black Hills, which push up against Wyoming’s eastern edge. While not quite The Rocky Mountains, The Black Hills are an appealing destination nonetheless. There is a surprising amount to do in The Black Hills. A family could easily spend a week or more there without feeling like they had seen it all. Getting to The Black Hills from our starting point of Boulder, Colorado (where my wife and I spent a couple days with my brother Tom and his wife) made for a memorable driving journey through the eastern half of Wyoming. It takes about six hours of driving to get to Rapid City, South Dakota from Boulder. You pass through hundreds of miles of empty land. It is not empty desert as you might find in Nevada, just miles of buttes with virtually no people and little in the way of trees to obscure your view. This is big sky country. For a while The Rocky Mountains shadow you to your west, and then they recede altogether. I-25 reveals a land dappled with vegetation which is not quite desert. Occasionally you pass picturesque places like the Platt River, but mostly the area consists of enormous ranches where widely scattered groups of cattle graze. For an east coast guy like me, Wyoming is appealing for its remoteness and its feeling of being unspoiled. It is not quite unspoiled. If it were unspoiled, it would be rife with bison and Native Americans on horseback. The bison were hunted to near extinction long ago and the Native Americans are now largely sequestered on Indian reservations on far less interesting land. Eastern Wyoming is a pacified west, with only an occasional oil derrick to spoil its majestic view. Pass from Wyoming into South Dakota and not only do you find yourself in the gently rolling Black Hills, but you also feel you are in a different climate. Wyoming feels dry but South Dakota, at least its western side, receives more rain, so there is more vegetation, more green things on the fields and plenty of pine trees and gently winding roads. Yet like Wyoming, it still feels remote. This is something of an illusion. While South Dakota remains one of our least populated states, if you travel through The Black Hills you will find plenty of tacky tourist traps, roadside family restaurants, inexpensive campgrounds as well as some first class tourist attractions. My wife and I took in three such attractions on Monday, working from our home base, a Country Inn & Suites in Rapid City. Rapid City, like The Black Hills near which is sits, is a pleasant city in its own right. While the East Coast sweltered under a heat wave, we enjoyed blue skies, dry weather and highs around eighty degrees. There are lots of dead presidents in Rapid City. Since it is something of a way station for people on their way to Mount Rushmore, it plays up its association with U.S. presidents by placing metal sculptures of presidents on its street corners. It is also a thoroughly white area of the country. If you are Anglo Saxon, you will find plenty of your own ethnicity in this state. Rapid City also ensures that you have to wade through plenty of traffic lights on your way to Mount Rushmore. Naturally there are plenty of businesses catering to tourists along Mount Rushmore Road. We noted some pretty inane tourist attractions, including a Cosmos Mystery Area and an Old MacDonald’s Farm that would make even Mr. Rogers retch. 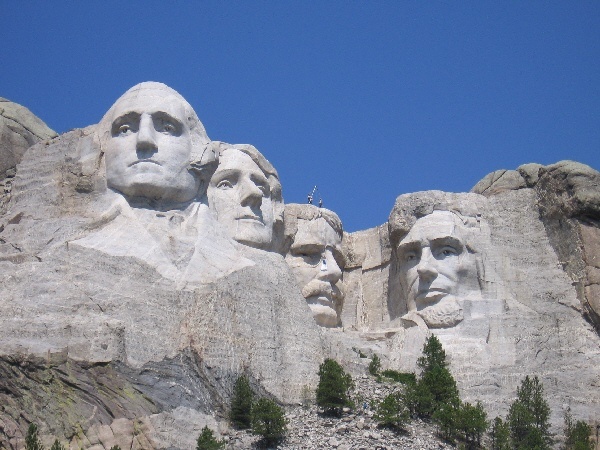 Mount Rushmore remains a worthy destination, but what makes it distinctive is not just the chiseled images of four great presidents on the face of The Black Hills, but its frame of the beautiful Black Hills themselves. One can of course marvel at the engineering involved in making Mount Rushmore back in the 1930s, but the geography only allows you to see it from a few angles. There is a large promenade and theater which sits before the mountain that will tell you more than you probably want to know about the memorial, and a trail you can take with many steps that will take you half way up the mountain, but no further. You can look at models of the memorial in a sculptor’s studio. To my mind, far more impressive is the Crazy Horse Memorial some twenty miles away, which sits atop its own mountain not too far from the town of Custer. It is a work in progress. Some sixty years since construction began, the memorial consists mainly of Chief Crazy Horse’s head and an exposed tunnel of granite. When completed, this memorial will dwarf Mount Rushmore. In fact it will be in the largest chiseled work of art in the world, surpassing even the Great Pyramids. Construction might have proceeded at a faster pace had Korczak Ziolkowski, the obsessed visionary who also helped chisel Mount Rushmore not spurned government money. The Ziolkowski family still directs work on the mountain, and supports its construction primarily with fees contributed by visitors. At $10 a person or $27 for a carload, it looks like the project will remain well funded through private sources. For an extra $4 you can take a bus ride to the base of the memorial, or you can observe it from a distance, and enjoy the many buildings on its campus. It is hard to find fault with the project, which seeks to honor a distinguished and fiercely independent Native American chief for all posterity. There are many Native American artists selling amazing works of art on premises. The scope of the project is audacious and is unlikely to be completed in my lifetime, or even my daughter’s. 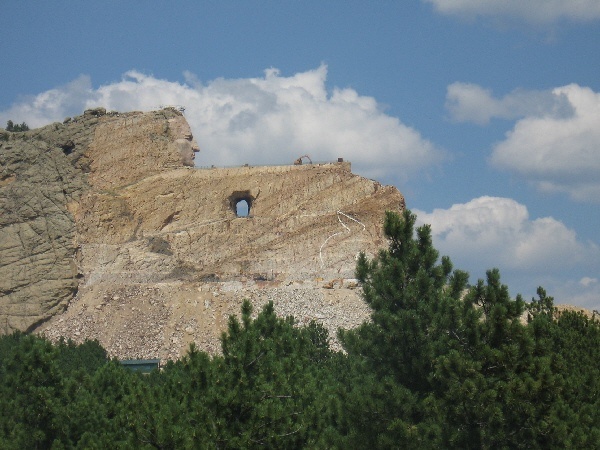 To get a sense of the scale of the project, Crazy Horse’s face, which has been completed, is much larger than the engravings on Mount Rushmore itself. Still one cannot feel more than a bit humbled by the size and scope of this amazing engineering endeavor and labor of love. I do hope that one day it is fully realized. If so it will be a new wonder of the world. After seeing so much enormous statuary, we were glad to end our day underground touring Jewel Cave, also located in The Black Hills. The Crazy Horse Memorial and Mount Rushmore are monuments to man’s audacity and ambitiousness. Jewel Cave is a monument to Mother Nature, who has the luxury of time to dazzle us with underground delights. Over the years I have gone on a number of cave tours, but our tour of Jewel Cave was by far the most extensive and interesting of the bunch. Jewel Cave is enormous, measuring 146 miles. It is likely a lot larger, since based on air pressure calculations only about three percent of the cave has been mapped. The site was designated as a national monument by President Teddy Roosevelt, so it is perhaps fitting that his face is chiseled in granite on nearby Mount Rushmore. Two elevators take tourists down nearly three hundred feet below the visitor’s center. We had an excellent park ranger who guided us on a ninety minute tour of the cavern. We marveled at the diversity of rock formations and crystals in the cave, which is second in size only to Mammouth Cave in Kentucky. Having the cave managed by the National Park Service made quite a difference compared to places I am more familiar with that were privately run. The park ranger provided a great deal of cave history and explanations for the natural works we witnessed. 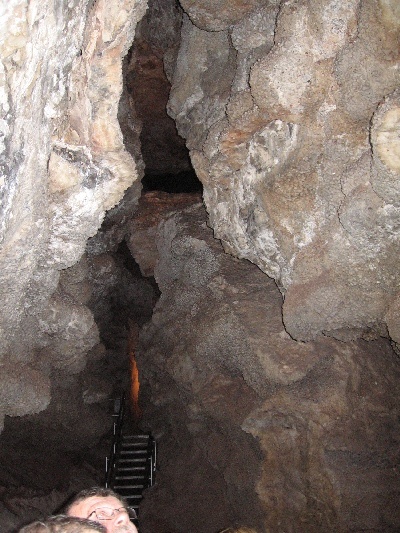 The extensive sets of staircases made traversing the cave as painless as possible. The forty nine degree temperature made it invigorating after being outside all day. If you have been flying over South Dakota like me, you are doing yourself a disservice by not stopping by for a proper visit. It is time to consider South Dakota as a vacation destination. For those enamored with natural wonders, there is much in South Dakota to enchant and delight.